Our microchips are of excellent quality, but a lost dog with a microchip is STILL a lost dog if the microchip is not registered to an owner! 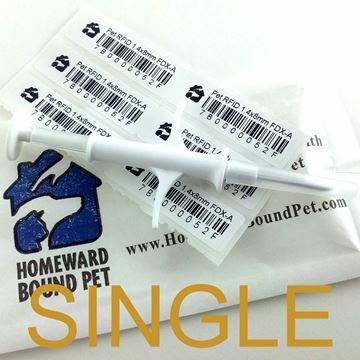 Registration with Homeward Bound Pet costs only $20. for the lifetime of the animal. All of our microchips are shipped with activation cards, but if you need more, feel free to order as many as you need. Free shipping too! High quality mini microchip, 1/3 smaller chip and needle than previous kinds. Readable with all universal scanners and most Avid scanners. Need 100 or more? 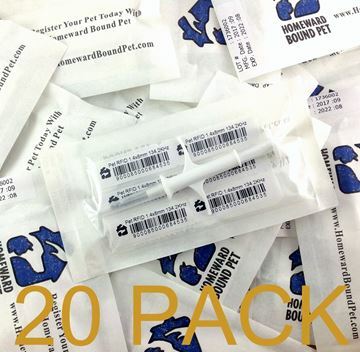 Check out our bulk-discount pack of 100 instead!